Nobody likes commercial breaks, but advertising is what keeps so many of our beloved products like Wordpress, Gmail, and ABC's The Bachelorette online and available. And it's not just a necessary evil, it's a really interesting and really valuable opportunity for creative thinking. Advertisers have a fascinating problem: how do you convince someone that they should purchase a product, given that they're likely bombarded by around 5,000 ads per day and that even if they do notice you they'll probably resent your interruption? Google goes for data. With their giant suite of products they're able to capture ever more data about you, and if you read up on their business plan it's to (eventually) present ads that are so targeted and so relevant that you're glad to see them. In conventional media, ads can be bright and flashy (Sunday Sunday Sunday! ), loud and annoying (Head On! Apply directly to forehead! ), or downright subtle.That's the idea behind product placement, which is designed to sneak past your anti-advertising filters and make you think, "yeah, Doritos really would be good right now." Companies can appeal to childhood memories (Coke), sports heroes (Nike), heartstrings (SPCA), or national pride (Bud). But the ones that I find most exciting are those that engage our minds and our curiosity. The Sony Bravia series from 2008 is a favorite. How do you show someone how beautiful a high definition TV can be when they need one to understand? Answer: immerse them in an iconic city, then add some soulful Jose Gonzales and a million colorful bouncy balls. The result is, well, beautiful. Four years later I still think about this commercial; I haven't bought a Bravia, but they definitely succeeded in standing out from the crowd (and there's even a Facebook fan page). Given the size of the industry and the amount of talent out there, it's easy to name hundreds of memorable ads. What are your favorites? As QR codes have become more common, they've begun to fade in the eyes of consumers. Getting people to pull out their phones and scan over to the advertiser's website is taking a bit more work, but with a 30% tolerance in readability some designers have taken license to play. I recently came across this fun compilation on Mashable of some of the most creative designs out there, with more at BitRebels. Update: Click on through for some fun concept re-designs of those ubiquitous UPC bar codes. 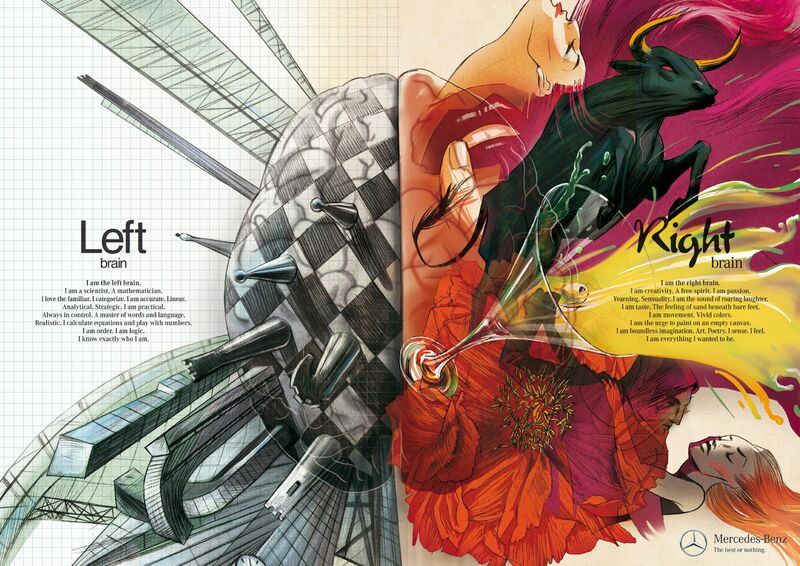 One of the consistent themes in research on creativity is that it ISN'T all about the "right brain". While the unstructured and unexpected are at the heart of the creative process, realization of useful creative output requires structure, discipline, and execution. This series of ads done for Mercedes-Benz in 2011 (Shalmor Avnon Amichay/Y&R Interactive Tel Aviv, Israel) highlights the contrast beautifully.